As my daughter (and our book collection!) continues to grow, I’ve decided to share the love and give some of our books away to friends with younger children. Before they go, here are my thoughts on them. 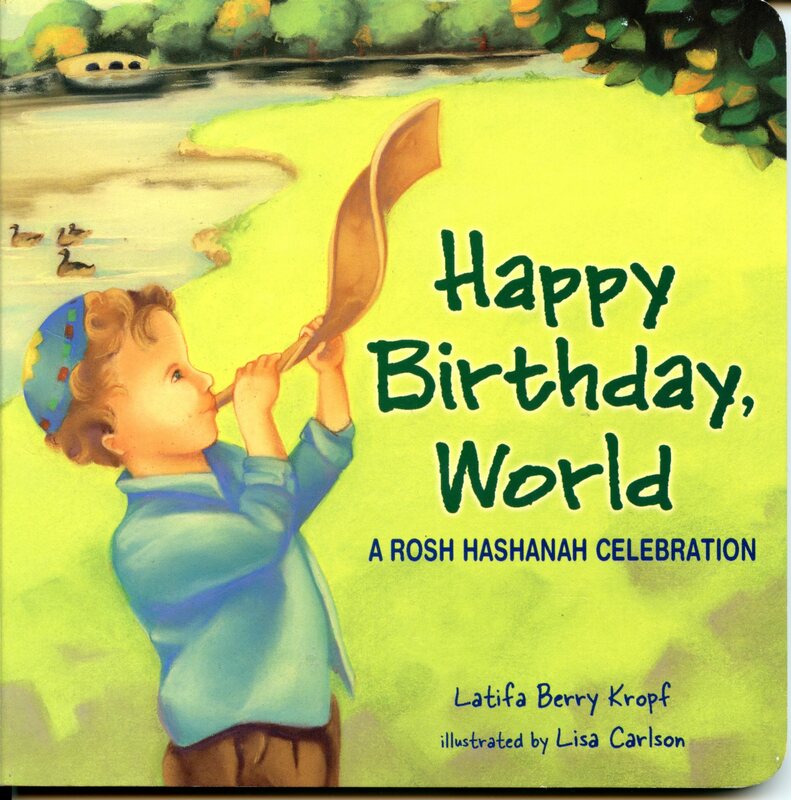 Happy Birthday, World introduces some of the customs of Rosh Hashanah (eating apples dipped in honey, blowing the shofar, giving tzedakah) by comparing them with activities a child would associate with their own birthday (eating cake, tooting party horns, getting presents). The realistic illustrations show a contemporary boy and girl with their parents. It’s a board book with simple text, suitable for the youngest of children able to follow along. 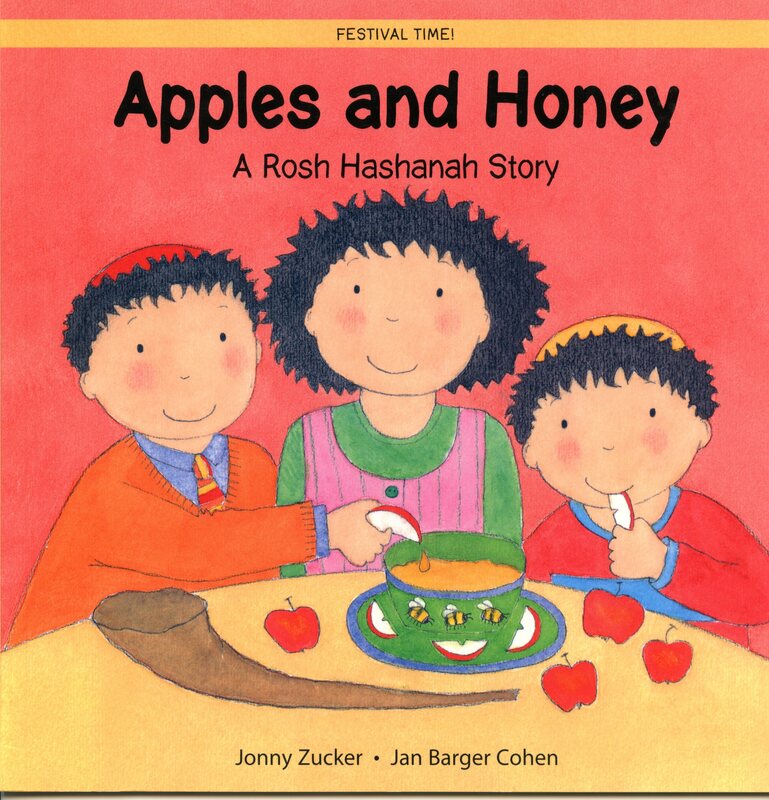 Apples and Honey introduces a more extensive list of customs of Rosh Hashanah, including wearing new clothes, performing tashlich and eating pomegranate on the second evening. Despite the title, it’s not really what I’d call a story, although it follows a family through a set of scenes. The illustrations are engagingly colourful. There are a couple of pages of explanatory material (in child-friendly language) at the end of the book, including one on blowing the shofar. I would suggest suitable for children 2 or 3 years old. Jossi is the son of the local baker, and he is very proud to help his father make bread for the townsfolk. One day he is proudly carrying freshly plaited “challahs” to the oven when suddenly he trips. The loaves roll down the stairs, becoming round in the process. The townsfolk are at first unimpressed by these strangely misshapen challahs, but on the eve of Rosh Hashanah the local rabbi is inspired to find meaning in their shape, and soon everyone is agreeing with him. 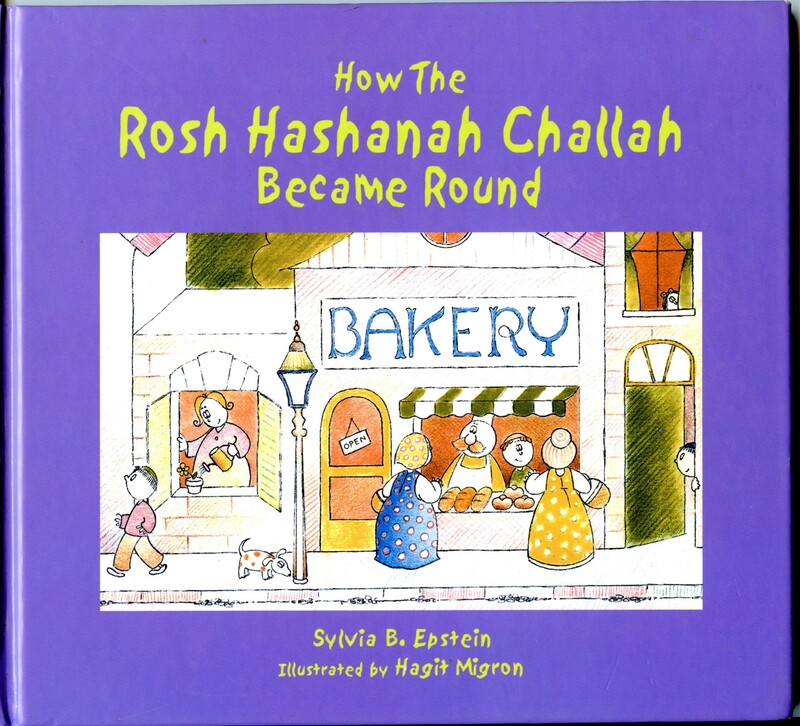 This book assumes familiarity with the concepts of challah and Rosh Hashanah, and offers a gently humorous explanation for a question which probably occurs to children each Rosh Hashanah. The illustrations are very simple cartoons. It’s a little longer than the previous two books, and would be suitable for children over 3, or who are in that “Mum, why is….?? ?” stage. 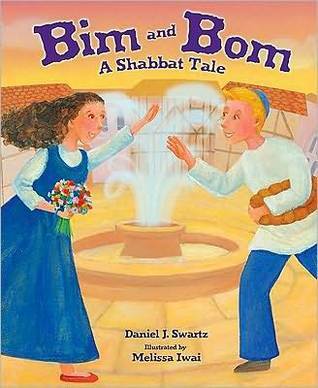 Bim and Bom – A Shabbat Tale by Daniel J Swartz, illustrated by Melissa Iwai. This is our favourite Shabbat story. Bim and Bom are siblings: Bim (the sister) is a builder and Bom (her brother) is a baker. Each works hard at their job during the week, and on Friday they do mitzvot, something to help others, before rushing to meet each other and welcome in Shabbat. At the end of the book are the words and tune for the song “Bim Bom (Shabbat Shalom)” which, perhaps unsurprisingly, is one of our favourite Shabbat songs. Things I like about this book compared to other shabbat books we’ve seen include: the refreshing lack of gender stereotyping or annoyingly trite rhyme, the lovely colours of the illustrations, the way Shabbat is given a context in the week and the emphasis on the kindnesses the siblings show to others rather than just the specific rituals of Shabbat. I think 3+ year olds would enjoy this story. Midrash for toddlers! This is a beautiful little board book, aimed at children under 5. Everyone knows what happens in the famous biblical story of Noah – God tells Noah to build a boat and stock it with animals prior to the impending floods. But what about Noah’s wife? 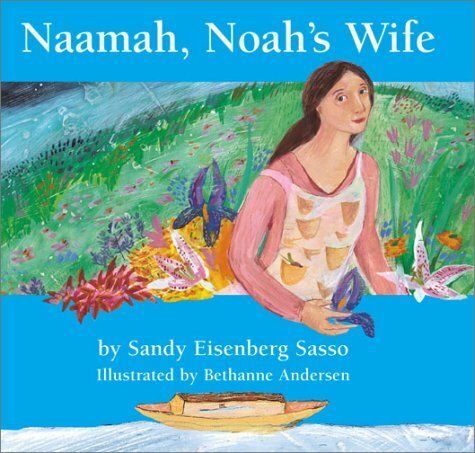 In this gentle tale, Naamah is given a different instruction by God – she is asked to collect two of every kind of seed from all the plants of the world. This is a lovely new perspective to an old but much loved story. 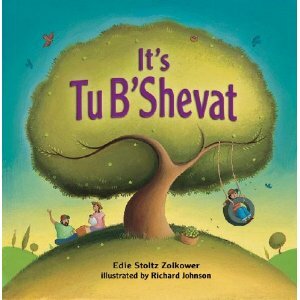 With its theme of valuing plants as highly as animals, this is another good children’s book for Tu B’Shevat. This is a very sweet little board book, probably suitable for children over 2-2.5 and definitely enjoyed by three year olds. The story is actually a simple, upbeat poem which tells you what you can do for Tu B’Shevat: “Grab a shovel. Pick a spot. Plant a tree – it’s Tu B’Shevat!” Plant it, bless it, appreciate what it gives back to you, enjoy it – and do it all again at the same time next year. Set in a snowy European countryside of the imagination, this is the story of old friends who meet for a Hanukkah party. Each intended to bring something different to share, but due to a series of mishaps, they all end up bringing the same thing – latkes. Fortunately they know how to make a Hanukkah party special, even with a limited dinner menu. This book is cute (and comes with a bonus latkes recipe in the back cover) but I found myself thinking what a shame it was for the lovely characters in the story that they had no family or children to celebrate with. And again, it would be lovely to have a Hanukkah story which reflected our own, much warmer reality. This is a very sweet folk story with a feel-good ending. It’s about a boy named Joseph and his grandfather, who is a tailor. Grandfather makes Joseph a special blanket when he is a baby. Over time, the blanket becomes worn and Joseph’s mother wants to throw it out. Joseph rushes to his grandfather, who carefully cuts and sews and recycles the fabric into something new. The pattern is repeated over the years as Joseph grows, but what happens when he loses the button made with the last shred of fabric? The illustrations in this book are lovely, depicting Jewish shtetl life in the 1800s (? ), and could form the basis of much extra discussion with your child as they grow. Below the floorboards live a parallel family of mice, who also make use of the wonderful fabric that Joseph loves so much. I’m not sure how easy it would be to find this book in Australia, but I bought a second hand copy (in nearly mint condition) from a US bookstore via Abe Books and highly recommend them. 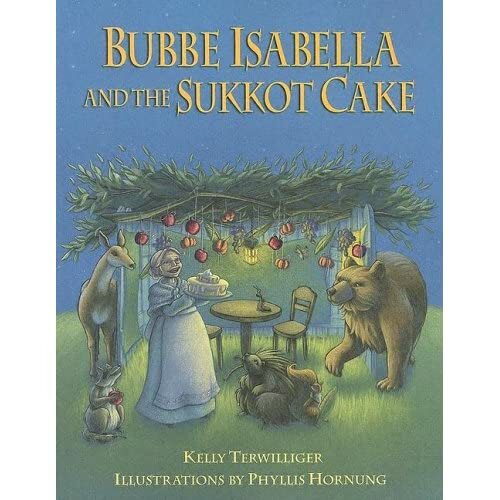 This is a very sweet story about Bubbe (Granny) Isabella who builds a sukkah, bakes a sukkot cake and hopes guests will visit her. The visitors she receives over the week-long festival are all friendly animals who join her in singing and telling jokes in the sukkah. None of them want to eat the cake, and what finally happens to it is quite entertaining, especially from a toddler’s perspective! At the end of the book, Bubbe Isabella turns to the celebration of Simchat Torah. Reading from an Australian perspective you may want to reverse the seasons to match the local reality, as Sukkot is an autumn festival in the northern hemisphere but here we are just launching into spring. If someone would re-write this story with Australian animals it would be fabulous!